If you have plans to remodel your kitchen, make sure that you give a lot of thought to your kitchen's lighting design and fixtures. Or, if you aren’t ready for a whole kitchen renovation, maybe you could give your kitchen a comparatively inexpensive facelift with some new lighting. The right kitchen lighting can make a big difference, both from a functional and a decorating perspective. In a kitchen, it’s important to have the proper lighting to perform cooking, chopping, measuring, and cleaning tasks as well as to read recipes and to enjoy meals. Properly designed and planned lighting also can make a big decorating impact, especially in today’s popular open floor plans where the kitchen is often seen from adjoining rooms. 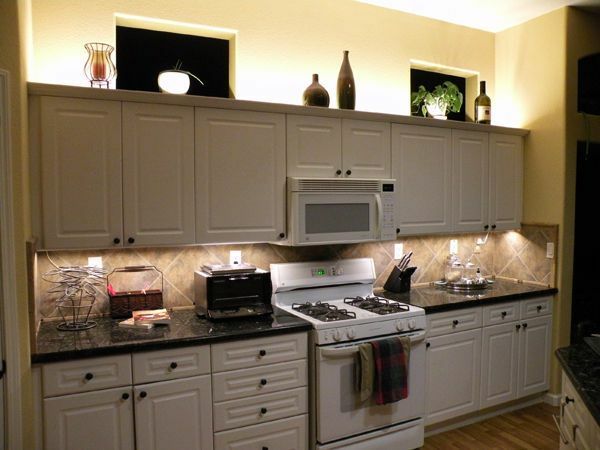 Dimmer switches are easy and beneficial for controlling the lighting in your kitchen. They also help light bulbs last longer and save energy. Dimming the lights over an eating area can add a nice ambiance, and dimmers can also help you adjust your eyes slowly to the early morning light. Recessed lighting is a popular choice in kitchens for several reasons. Because this style is relatively inconspicuous, recessed lighting complements virtually any décor style. It can be used to light sinks, countertops, cooktops, and corners. Recessed lighting is great for kitchens with low ceilings since no clearance space is needed for fixtures. A good rule of thumb is to plan on one recessed light for every four to six feet of ceiling space. 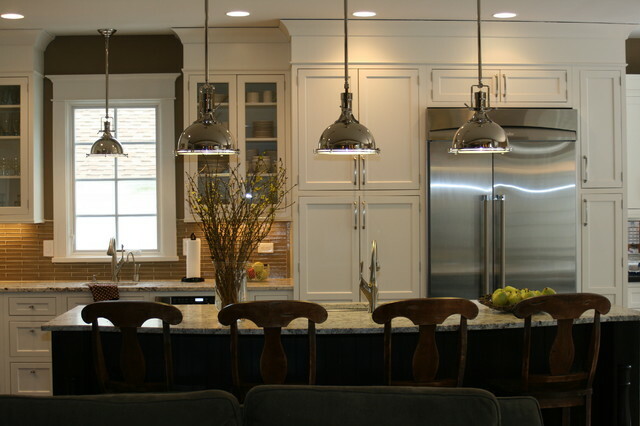 Two types of cabinetry lighting for different kitchen lighting are over cabinet lights and under-cabinet lights. Over-cabinet lights can be used to highlight dishes and decorative displays on open-topped cabinet designs, and under-cabinet lights are more for task lighting or to spotlight backsplashes. Over-cabinet lights often employ energy-efficient LED bulbs, while under-cabinet lights might use LED strips, fluorescents, halogen, xenon, or rope lights. The American Lighting Association recommends placing under-cabinet lights toward the front of the cabinets for even light distribution. Toe-kick lights are a growing trend for kitchens. These LED strips are installed on cabinet bases for a glow near the floor, which makes them convenient night lights for after dark kitchen snack visits. You can even put toe-kick lights on motion sensors so that they turn on whenever someone walks into the kitchen. 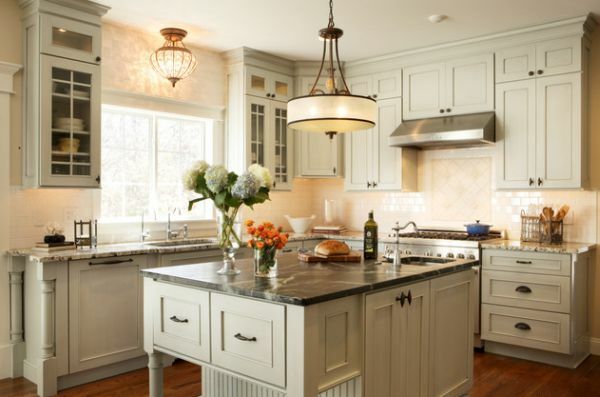 Pendant lighting is very fashionable for kitchens right now, especially when used over islands or breakfast bars. Available in a wide variety of styles, shapes, colors, and sizes, pendant lighting can be modern, traditional, or rustic. Adding pendant lights can also help add warmth and interest to a kitchen with high ceilings, and can help define the kitchen area in an open floor plan. 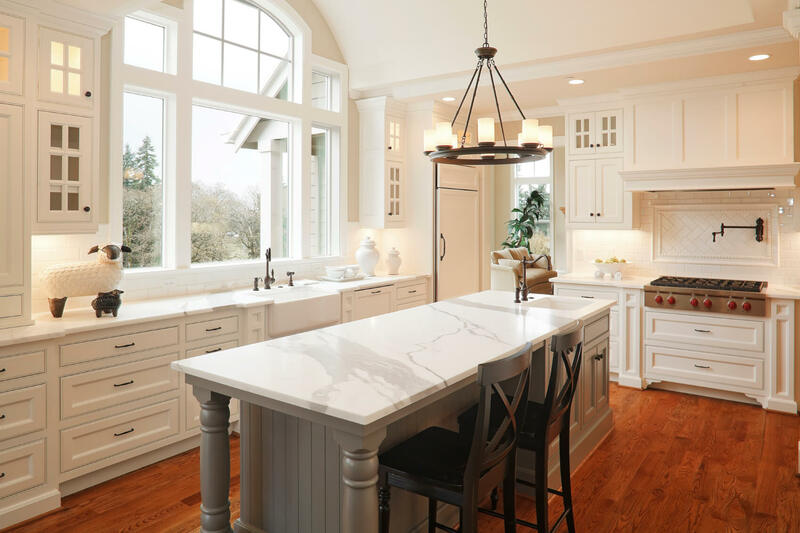 When using pendants over a countertop, it’s recommended to use one fixture for every two feet of counter space, and to consider using an odd number of fixtures for balance. If you think a chandelier might be too fancy for your hardworking kitchen, you might want to think again. Today’s chandelier fixtures can be traditional and elegant as well as funky and eclectic. A single chandelier can be used in the center of your kitchen or over an island as a focal point, or you can use multiple, smaller chandeliers in a pendant lighting design. When choosing a chandelier, pay attention to the scale of your kitchen as well as ceiling space and ceiling height to select the right size for the room. In a room that often heats up from oven and stove use, ceiling fans with lights can be beneficial as well as attractive. A ceiling fan can help significantly lower energy costs and can help make a room more comfortable without adjusting the thermostat. Choose an Energy Star rated fan for added efficiency. Like pendant lighting and chandeliers, ceiling fans come in a wide array of styles, sizes, and colors. Some even have interchangeable blade sets to enable you to change the style of the fan without installing a completely new fixture. Incorporating LED (light-emitting diode) bulbs and fixtures into your kitchen lighting design can help you save energy and effort, because they last much longer than traditional bulbs so you don’t have to change them as often. Many recessed lighting fixtures can be retrofitted for LEDs with a remodeling kit, and over-cabinet, under-cabinet, and toe-kick, and rope lighting can use LEDs, too, as can some pendants and chandeliers. LEDs can also be used for small spaces, like task lighting for drawers. Many people don’t think about lamps for the kitchen, but lamp light can add a cozy warmth as well as light up dark areas, such as countertop corners. Consider adding a small lamp to the corner of an island or breakfast bar, or on top of a kitchen desk. Select a shade that can be easily cleaned as cooking oils and debris may settle on it over time. Don’t forget about natural light! It’s free, and it can’t be replicated by artificial lighting. If possible, design your kitchen so there’s at least one available window to allow daylight to stream in. Select any window coverings carefully so that they don’t block the light or can be easily opened. If you don’t have enough wall space for a window, or if your kitchen doesn’t have an exterior wall for one, consider installing a skylight. Antique stores and junk shops are often great sources for unusual lamps, lanterns, sconces, and chandeliers that can be used to add character to your kitchen. Be sure to have an electrician or a lighting store professional check out the wiring for you before installing. Whatever lighting you choose for your kitchen, be sure to consider your cabinet finishes, countertop materials, flooring, and color scheme. You want the lighting to complement and reflect the overall style and design of your kitchen. Since the kitchen is the heart of the home, it’s also nice if the lighting ties in well with the rest of your décor, too.